A recent study on alcohol consumption’s effect on emotions confirmed what we’ve suspected all along: drinking alcohol can make you feel pretty good. But beyond feelings of sexiness and “liquid courage”, boozing can come with some darker emotions like aggression and restlessness. The feelings you experience while drinking is be influenced by the amount you drink, but also in part from the type of beverage you’re indulging in, according to researchers. Essentially, to every booze, there is a buzz. The study comes from researchers associated King’s College London and the Public Health Wales National Health Service, who examined data from the 2016 Global Drug Survey. The survey interviewed nearly 30,000 participants ages 18 to 34 years old from 21 different countries. The anonymous online questionnaire was translated into 11 different languages. 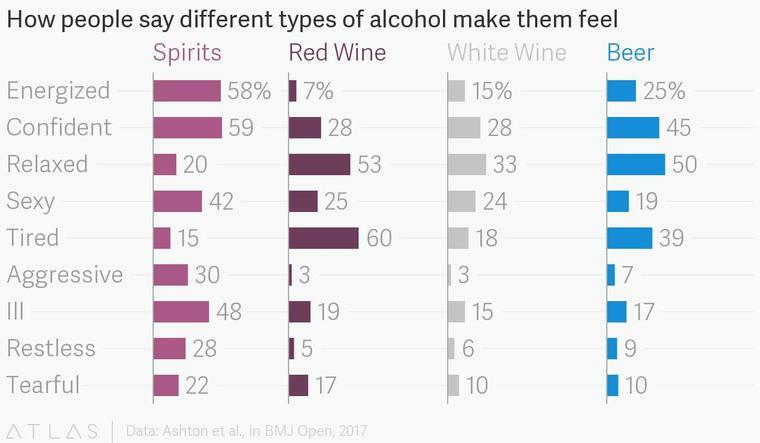 In the survey, participants answered questions about the emotions they experienced after drinking spirits, red wine, white wine, and beer. Subjects also provided information on their background, including gender, age, and drinking habits. Study results showed that spirits, like tequila and gin, were associated with the most powerful emotions, including sexiness, confidence, and energy. 30 percent of subjects reported feeling aggressive after drinking hard liquor. By comparison, only 7 percent said they felt more aggressive after downing a few beers, and only 3 percent experienced aggression after drinking red or white wine. I better see this as the next addition to the Oxford dictionary! On the other hand, more than 50 percent of participants associated feelings of calm with beer and red wine. Over 60 percent of participants claimed to feel tired after drinking red wine—no surprises there. Interestingly, female participants reported experiencing a wide variety of feelings while drinking all types of alcohol, apart from aggression. Study participants with a greater alcohol dependency also attested to experiencing many different emotions, and were more likely to feel aggressive after drinking.